Since arriving in 2010, the Ducati Multistrada 1200 stuck to its roots of a four-in-one bike that offers “endless transformation.” This was due to the bike’s engine mappings that were changeable on the fly: Sport, Touring, Urban and Enduro. The Multistrada 1200 was an immediate success, winning many awards, and only got better in 2015 with the introduction of the new engine – the 1198cc Testastretta DVT (Desmodromic Variable Timing) that produces 160 horsepower. But though capable in Enduro mode, which drops horsepower to 100 and allows for rear tire spin and a snappier throttle, the Multistrada was never a true off-road capable motorcycle – a segment that BMW has ruled with its R1200GS and KTM with its 1190 Adventure. The main problem? The 17-inch alloy wheels that can quickly get destroyed when off-road riding intensifies. Plus the 5.3-gallon tank didn’t get you too far – 180 miles at best under perfect riding conditions (read – not fun). Ducati has listened to the crowds, and is finally offering a true ADV machine – the 2016 Ducati Multistrada Enduro. The Enduro is highlighted by spoked wheels – 19-inch front and 17-inch rear – wrapped in Pirelli Scorpion Trail II tires, and a large 7.9-gallon gas tank that Ducati says will provide 280 miles between fill ups. Adding to the mix for supremacy in the “maxi-enduro tourers,” Ducati has fitted the Multistrada 1200 Enduro with electronic semi-active Sachs suspension, cornering ABS and – for the very first time on a Ducati – Vehicle Hold Control, which aids in uphill starts. The other noticeable difference on the Ducati Multistrada Enduro is the use of a traditional dual-sided swingarm in place of the gorgeous single-sided setup; the dual-sided swingarm provides better strength for off-road situations. Along with the bigger fuel tank, Ducati has extended the front beak, added an aluminum sump guard, and has now made the two tank side covers out of anodized aluminum. Ergonomics were also tweaked for the true ADV rider, and the Multistrada 1200 Enduro has a higher handlebar and a narrower seat, which is 34.25 inches standard, but available in a higher version (35 inches) and a lower version (33.46 inches). The windscreen on the Multistrada 1200 Enduro is adjustable with one hand, and offers 2.36 inches of travel. As for other ADV-savvy features, the Ducati features two 12 V power sockets, an underseat USB socket, and a center stand as standard equipment. 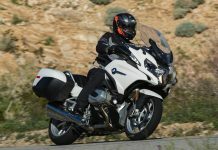 Heated grips and Touratech panniers are available as options. The engine is the same one offered in the other Multistradas, the DVT producing 160 horsepower at 9500 rpm and 100 ft/lbs of torque at 7500 rpm. The engine is mounted to a six-speed transmission that features a lower first gear ratio over the other Multistradas, and a high-mounted 2-1-2 exhaust. Besides the four riding modes, the Ducati Multistrada Enduro arrives with Ducati Traction Control, Ducati Wheelie Control, 3-level cornering ABS, Ducati Cornering Lights, and a hands-free ignition. Of course, the Multistrada 1200 has LED lighting. The Ducati Enduro’s suspension is handled by a 48mm Sachs front fork and a rear Sachs monoshock, both controlled by Ducati Skyhook Suspension. The Enduro’s suspension ensures 200mm of wheel travel at both the front and rear for optimal off-road performance.